Found the perfect fabric for your new curtains but not sure how to measure for them? This step-by-step guide should make it easy. Check out the window size, tot up the results and you'll be well on your way to creating your own fabulous curtains. Decide on the fabric first as you need to know its width to do the sums on how much to buy. You will also need to decide on your heading tape as that affects the width of the curtains. Choose standard heading tape for shallow pleats, or pencil pleat tape for neat rows of deep pleats. Remember that heavier fabrics will need less gathers to look full. First, you need to calculate how many widths of fabric you will need to cover the width of your window. Measure the length of the track or pole you’re using and multiply this figure by 1.5 if you plan to use standard heading tape, or by 2.5 for pencil pleat tape. Now add on 20cm overall for side hems. Divide this figure by the width of your fabric. Round up the result to the next whole number. For example, if your pole measures 200cm, multiply by 1.5 (for standard heading tape), and add on 20cm for hems, which equals 320cm. If your fabric measures 122cm wide, the sum is 320 divided by 122, which equals 2.6. The next whole number is 3. So, three widths of fabric, when gathered, will cover the window, and each curtain will be made of 1½ widths of fabric. Decide on the length of your finished curtains. If you're using a curtain pole, start measuring from the base of the rings from which the curtains will hang. If you're using a curtain track, measure from 1cm above the top edge, so the curtain heading will hide the track. 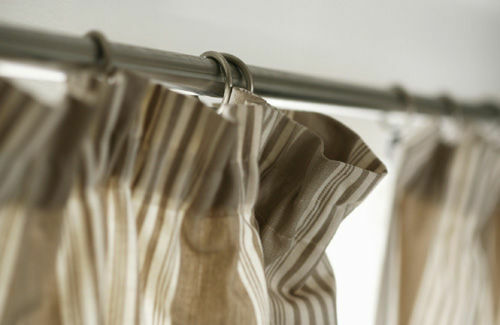 For floor-length curtains, allow 1.5cm clearance between the lower edge of the curtain and the floor. If you want your curtains to touch the floor, add 5cm to your measurement and if you want your curtains to puddle on the floor, add 51cm. Finally, add on 3cm for the turning at the top and 12cm for the hem. This measurement is the cutting length for your fabric. If your curtains will be made from a plain-coloured fabric or a fabric with a small pattern that won't require pattern matching, simply multiply the number of fabric widths by the cutting length and add 10cm per curtain. This is the amount of fabric you need to buy. If you've chosen a fabric with an obvious design, you will need to buy extra fabric because each length must be cut at the same point in the design so the pattern will match across both curtains when they are drawn. To calculate how much patterned fabric to buy, take the cutting length and add the length of the pattern repeat (this should be stated on the fabric label in the shop). Multiply this new cutting length measurement and multiply by your number of fabric widths and add 10cm per curtain. This is the amount of patterned fabric you need to buy. You will need the same amount of lining fabric as curtain fabric, minus any extra length added for pattern repeats. Take the measurement of your curtain pole or track and add 10cm to calculate how much curtain heading tape to buy.